From mid. 2002 on, Lotus (and Rover) decided to change from the older Green colour fluid to this Red colour Organic Acid Technology (OAT) Coolant. Conventional antifreeze is formulated with inhibitors composed of neutralized inorganic acids, such as phosphates and silicates, to protect a cooling system against corrosion. Over time, however, inorganic inhibitors deplete and may no longer provide maximum cooling system protection. This is why it is generally recommended that conventional coolants be changed every 2 years or 24,000 miles. 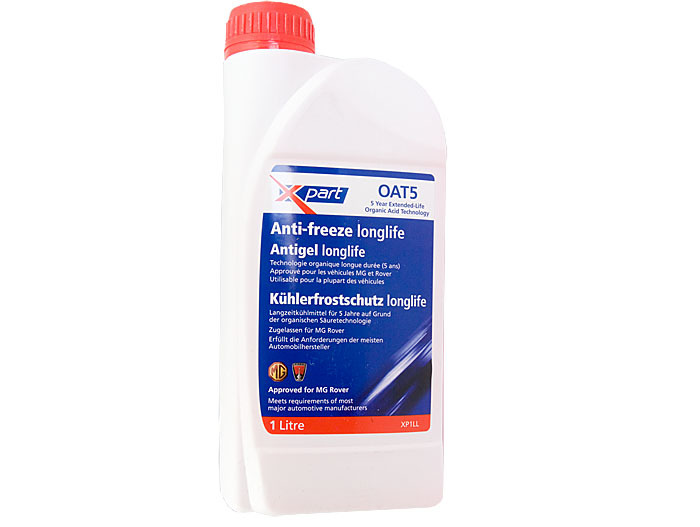 In contrast, OAT coolant is formulated with neutralized organic acids to form a highly effective corrosion inhibitor system that provides maximum cooling system protection. Organic inhibitors do not deplete as quickly as the inorganic inhibitors used in conventional coolants. This is why properly this OAT coolant typically provide up to 150,000 miles or 5 years of cooling system protection between service intervals.